If you do not want to weave a braid, it is a great substitute. Twisted wig braid hairband is a nice decoration. Textured and glossy twisted wig braid. 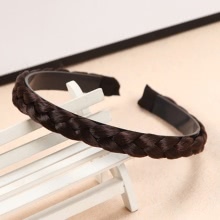 Small Toothed hairband could be worn firmly on head. Nice gift for your friends.